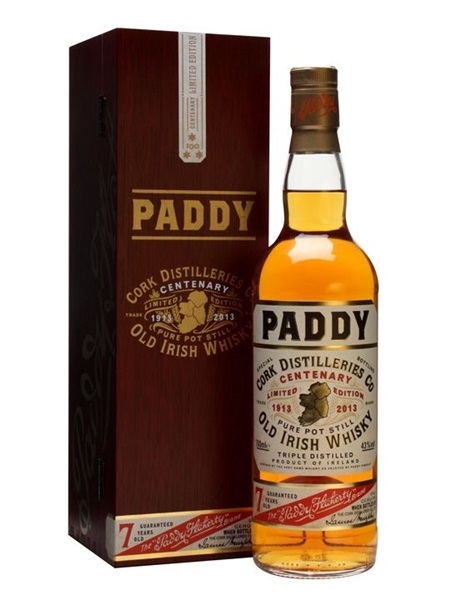 Paddy Centenary Limited Edition (~€78) was released in 2013 to mark the 100th year since Cork Distilleries Co. relaunched their product as 'Paddy', named after their influential salesman, Paddy Flaherty. Paddy certainly rolls off the tongue far easier than the previous 'Cork Distilleries Co. Old Irish Whisky'. Standard Paddy, as we know it today, is a light blend of Pot Still, Grain and Malt whiskeys. However, for most of it's life, Paddy was a Pure Pot Still whisky - a mashbill of both malted and unmalted barley. For this Centenary Edition, the recipe returns to the traditional Pure Pot Still aged for at least 7 years in mainly ex-bourbon casks and a little sherry. It is bottled at 43% ABV.